Luxury detached villa that can accommodate up to 12 people over 3 floors. Generous living accommodation that is spacious light and airy. Modern and contemporary living space consists of fully fitted kitchen, dining area, lounge with cosy fireplace, large games room/lounge area with fireplace situated on lower ground floor. 5 bedrooms, 4 have own balconies, 3 bathrooms complemented by a beautifully furnished large 1st floor terrace ideal for spending evenings drinking cocktails and admiring the beautiful sunsets. Large garden with grassed lawn and trees, private swimming pool, Pergola area, BBQ, makes it ideal for families. Set in a fantastic position close to the beautiful sandy beach at Glystra Bay. Provides the ideal location to take in all that Rhodes has to offer from historical sites at Lindos (5 mins drive away) and Rhodes Town or the beautiful bays at Pefkos or Lardos Beach. Shops, bars, supermarket and water sports just 5 minutes walk away. Ground floor bathroom with shower enclosure and wc. 1st floor bathroom with bath/shower and wc. Lower ground floor bathroom with shower and wc. Ground floor has open plan kitchen with dining table, seats 12 people. Lounge with 3 settees. Lower ground floor has lounge with 3 sofa beds and games area. Fully fitted kitchen with oven, hob, extractor fan, dishwasher, microwave, kettle, toaster, American fridge freezer, iron, ironing board. Notes on accommodation: The villa is fully air-conditioned for heat and cold. Double glazed windows and patio doors with security shutters and insect screens. Cot, highchair and travel cot and stair gate available on request. A welcome pack containing essentials can be organised on request. Guest manual including useful information and contact telephone numbers for the management team is available in the villa. Outside: The villa is surrounded by walls and trees to all sides with gates at the front leading from the main road onto the private driveway that can accommodate up to 4 cars. Extensive lawned gardens containing lots of shrubs and olive trees now growing. Large patios around the house with their own furnishings. 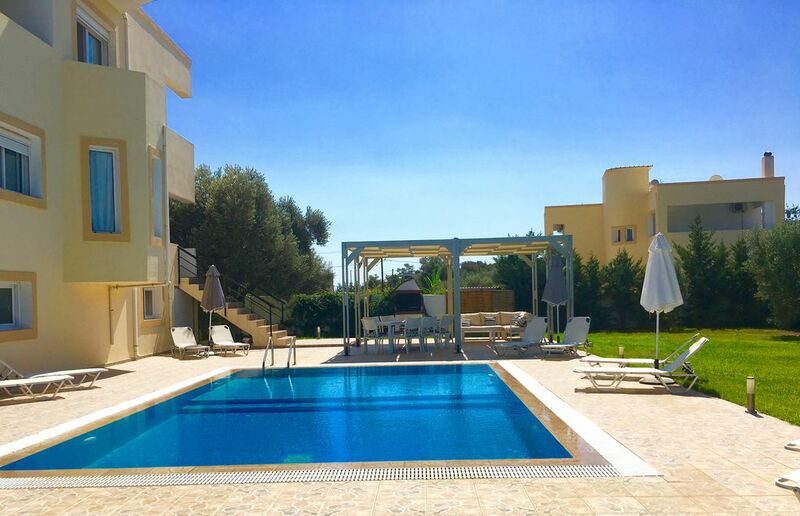 At the back of the villa is the private 8m x 5m swimming pool and a stylish pergola area which provides wonderful shade for the large patio table and comfy chairs. Sun loungers and parasols are also provided around the pool for sun bathing. BBQ area and a grass play area for the kids to have fun an ideal family villa. Cleaning / Towels / Linen / Maid service: Linen and towels provided. The villa will be cleaned every change over. Bedding and towels will be changed weekly however if you would like additional cleaning maid service can be arranged on request (payable locally). Beach towels are not provided. Other: Large terrace on 1st floor with comfy conservative furniture ideal for watching the sun go down whilst sipping cocktails. Lower ground floor has lounge with sofabed further bedroom and bathroom. This is a really spacious and well equipped villa, in a wonderful location near to the best beach we have been to in years. Julie was very helpful, giving us recommendations for car hire and lots of very useful information about places to visit and eat. The car hire firm was Rodos cars and everything was extremely efficient and easy to arrange/find at the airport. The villa was easy to find, too, with very clear directions and spotlessly clean when we arrived. Possibly the best aspect for us was the huge outdoor area and large pool, where we set up camp during the day and evening, as it is well lit and has comfy sun beds during the day and comfy sofas on a night. It is an easy drive/taxi to Lindos, Pefkos and Lardos and we loved all three, eating out virtually every night. In particular we had very nice meals in Valentina's place in Lardos and Stefano's fish restaurant right opposite the beach in Kiotari. Also the beach at Glystra was very much our favourite - it is a small crescent, very safe as it shelves slowly and there are a little cafe and loos. We had a really lovely stay in Glystra Villa and would definitely recommend it and hope to return. We've booked a few villas through Owners Direct but this one was by far the best! We hadn't visited Rhodes before and so didn't know the area. When I phoned Julie the owner she was incredibly helpful and gave me lots of information about places to visit and told me about Glystra beach (a beautiful, uncrowded beach) which was a few minutes walk from the villa. When the eight of us arrived we were very happy - the villa was spacious, light and airy and very well maintained. The pool was cleaned every day and the friendly management company were on hand to answer any questions. Lardos and Lindos are very close by and there is a very handy bus stop within metres of the villa to take you there. The taxi drivers were also incredibly helpful and even went to pick up some charcoal for us one afternoon when we'd run out! A great place for a quieter family holiday, but close enough to all the amenities, even if you don't hire a car. We stayed for 2 weeks in this fantastic villa. It was in a great location, with one of the best beaches we found on the Island only a five minute walk away. The villa was exceptionally well kitted out and we found everything we needed. There were four adults and four kids and the kids had lots of fun all sleeping in the same room in the basement. The outdoor area and the swimming pool were lovely. There is a handy bus stop 5 mins walk away which will take you into Lindos and Lardos. There are some great restaurants in Lardos -Valentinas and Savvas being our favourites and really reasonably priced as well. We hired a car for a couple of days which we hadn't pre-booked and we got this from the Hotel down the road. If you have children over 6yrs old, a visit to the waterpark is well worth it. The couple who looked after the Villa were really friendly and helpful. We really enjoyed our stay at Glystra villa which has to be one of the best villas that we have stayed in. The villa is very spacious, well equipped and furnished to a high standard and will sleep 12 comfortably. The pool is big and has a lovely seating area, in addition most of the bedrooms have their own balconies so even if 12 were staying in the villa there are plenty of places to find some peace and quiet if needed. The lower ground floor has a TV/ games room complete with table football which was a big hit with our young son especially during the hottest part of the day as it was always cool down there. The location of the villa is ideal with Lindos and Pefkos an easy drive away. The village of Lardos is also close by and is more of a traditional Greek village with a number of good inexpensive tavernas. You do need a car but the roads are good and everywhere is well signposted in English as well as Greek. The nearest beach is a ten minute stroll away and is ideal for children as it is sandy and you can walk out into the sea for some distance before it gets deep. The beach does not get crowded and it has a lovely café that provides cheap lunches and a good selection of cold beers when required. We had a wonderful holiday on Rhodes and have no hesitation in recommending Glystra Villa to anyone looking for superior accommodation in an excellent location. Fantastic location for touring the island, set back from the main road with good access to villages Lindos, Lardos and to the south Presonisi. Handy for Carrefour Express just a few mins drive away or local shop a few mins walk (tip: tell shopkeeper if there is something you want and he will stock it for you). Although we there was only 8 of us (3 couples plus 2 teenagers), the villa is plenty big enough for a large group of 10 with ease and maybe few more if you include the lower ground lounge. Never felt crowded as plenty of options for sitting together at pool or under the pergola and in own space around grounds. The management company greeter, who we understand have recently taken over responsibility, was very welcoming and informative. We found the nearby Glystra beach a delighful unspoilt family-safe bay with a no frills beach cafe catering for all tastes and very reasonable pricewise unlike some other beaches we visited. Feeling adventurous we booked a full day tour by quad bike (take lots of sunscreen and extra water) which was a wonderful family day out sight seeing and swimming at a secluded cove. A memorable holiday - definitely recommended ! Very enjoyable stay had by all. It is ideal for relaxing, swimming, reading books and enjoying some good local Greek wine on the terrace while taking in the beautiful views. It is in a quiet area of island, 10 mins walk from a lovely sheltered cove with a beach cafe and free wifi also handy for restaurants in Lardos and pubs & clubs in Lindos. Nicely thought out practical, clean and spacious accomodation of good standard however some of us felt the mattresses on the single beds were a little firmer than we were used to but still quite comfortable. Weather was beautiful but very hot so appreciated the aircon which is included at no extra charge :) Will be back next year ! 5 mins walk to Glystra Beach, described as one of Rhodes best sandy beaches, ideal for young children as it is a gently sloping beach and quite shallow, with its own beach bar and water sports and is a favourite with the locals. 3 mins drive to Kiotari beach which has great water sports facilities. 10 mins drive to Pefkos and the 3 bays in Lindos. Venture further south to Prassonissi where the rough Mediterranean sea meets the calm Aegean - a windsurfers paradise. Close to supermarket just around the corner, Spa and Health facilities at the hotels Lindian Village and the Miramare, where you can fully utilise their restaurants and bars just 5 minutes walk away. Excellent flight connections from all major cities to Rhodes Diagoras Airport, less than 1 hour drive away. Car hire is recommended to explore what this wonderful island has to offer. Cars can be pre-booked and arranged at either the airport, port or villa. For those who do not drive there are taxis available on call and there is a bus stop approximately 20m from the villa which runs every 20 mins to Lindos, Faliraki and Rhodes town or south to Gennadi and Kiotari and to Prassonissi. 2km Kiotari. 3km Lardos. 4km Lardos Beach. 5km Pefkos. 7km Lindos. 32.3km Faliraki. 43.5km Rhodes town. Minutes walk from the luxury 5 star Lindian Village Hotel which has several international restaurants and fantastic spa facilities. Glystra Beach is a small crescent shaped bay with golden sand surrounded with pine trees and sand dunes and has a small friendly beach bar serving food - a favourite with the locals. The bus stop is just at the end of the road and will take you south to Kiotari/Gennadi or to nearby villages of Lardos, Pefkos and Lindos. Lardos with its traditional greek square surrounded by shops and taverns very popular with the locals as it has a fishmongers and 2 great butchers ideal for those BBQ's. Lardos Beach (not to be confused with Lardos) is on the way to Pefkos and has a string of shops and restaurants and bars for you to enjoy whilst looking over the bay. There is also the Go Kart track and Crazy golf for the kids at Lardos. Pefkos with its peace and tranquillity in a lovely sandy bay surrounded by pine trees and well known for its popular bakery which opens long hours, to the lively restaurants and bars in the village. Lindos with its suger cube houses nestled at the bottom of the Acropolis and medieval castle, with its sandy beaches and lots of bars and restaurants to entertain you, and don't forget to have a ride on the donkey up to the top of the Acropolis the scenery is magnificent. Other places of interest include: Faliraki - miles of golden sand and ideal for water sports and sunbathing there is also the Waterpark which is great for the kids. Rhodes Town - wonderful place to visit the medieval Castle and do a bit of bartering in the old town market held every day. Valley of the Butterflies - a beautiful valley with waterfalls and fantastic scenery with the pretty butterflies flying around. Ancient Kamiros - an ancient town that was destroyed by an earthquake in 227 BC. Booking Notes: *Please contact owner directly to discuss booking* Please be advised villa price is based on a maximum of 8 guests. Additional guests are charged per person per week. Upon booking there is a 25% deposit payment to be made and the full amount is payable 2 months before arrival. For late bookings full amount to be paid before arrival. Payment to be made via Bank transfer. Changeover Day: Changeover day Saturday or Wednesday. The villa is available from 4pm, departure is prior to 11am. Notes on prices: Please note:- prices of the villa is for a maximum of 8 people, any additional guests will be charged per person per week. Children under 2 years old go free.